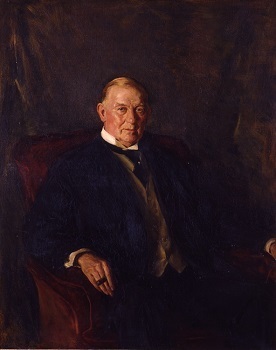 Portrait of James Buchanan Duke (1856-1925), father of Doris Duke and benefactor of Duke University, whose fortune derived largely from electric power and tobacco, a connection discreetly referenced by the cigar in the sitter's right hand. A 1922 oil sketch by Da Costa, now in the National Portrait Gallery (http://npg.si.edu/object/npg_NPG.82.149), appears to be a study from life for this portrait. The setting was, however, changed from an exterior view with blue sky and a landscape in the background in the oil sketch to the dark interior that you see here. There is a near twin to our James B. Duke portrait hanging in the Duke University Libraries alongside a posthumous portrait of Washington Duke, James B. Duke's father, in the same dimensions and with a similarly dark interior background and red, upholstered chair. The Duke University portraits date to 1924, as does the Rough Point portrait, and were likely commissioned to commemorate the $40 million donation made by Duke to the Duke Endowment that same year. The Duke Endowment supported several North Carolina colleges, including Trinity College in Durham, which would later be renamed Duke University after Washington Duke. But why the dark interiors? As a model for the posthumous portrait of Washington Duke, Da Costa appears to have used a 1904 portrait by Abraham Edmonds (also now in the Rough Point collection; 2006.585), in which the senior Duke is similarly posed in a dark interior. This likely determined the setting for the portraits of both father and son destined for Duke University, and by extension for the version of the James B. Duke portrait destined for the family and now hanging in Rough Point. Signed and dated in lower left. In hand-carved and gilded wood frame by Maurice Grieve (d. 1959, New York).